Jeremy Webb, Says Hi to a Hybrid. The Lexus NX300h. Road tests and reviews asked Jeremy Webb to put the Lexus NX300h SUV through its paces, and the car delivered. Luxurious interior, combined with great looks and handling impressed. The Lexus NX300h is a self-charging Hybrid with great looks and handling. Say Hi to a Hybrid, and experience the future now. The Lexus NX300h is a self charging hybrid which means no need for cables, wall chargers or range anxiety. Drive the car normally, refuel it normally and let the technology do it’s work. You will notice the difference between a hybrid and a conventional fuel only powered vehicle, in a couple of ways. An improvement in fuel economy through higher mpg figures. The NX300h gives an average mpg of 53 mpg, with best on a extra urban 55.4 mpg. The smooth, quiet pulling away is also another indication as initially the electric motor powers the car along so the combustion engine is not active, therefore not producing noise. The 2.5ltr motor becomes active when the accelerator is pressed firmly, or when the car reaches above, 40mph. You can choose how to pull away and the NX will adapt to deliver what ever type of performance you want. The beauty of having this Hybrid is the car regenerates power back in to the battery, when brakes are applied and accelerator pedal is lifted.The petrol engine is also cut off at this point, so no emissions are produced. Take a break from the hustle and bustle of the city, travel off the roads and enjoy the Countryside. Four wheel drive combined with large ride height will allow you to take the car on trails, to enjoy a different driving experience. tarmac and the journey back in to town. The NX range consists of Entry level SE, the Luxury, F Sport, and top of the range Premier. The best selling model is the Luxury. The majority of NX buyers choose four wheel drive which gives great handling to the SUV, both on and off road. The 2.5 litre engine combined with the electric motor produce 197 bhp, which delivers a 0-62mph time of 9.2 secs and up to a top speed of 112mph. Easily enough to power the car along Autoroutes at good cruising speeds. With holidays in mind, the NX can accommodate five people with all their luggage and modern day requirements. A large boot is both wide and flat allowing easy loading and unloading. A great list of standard technology means phones, tablets etc can be powered from two usb outlets, or connections through the 12v outlet. distributed around the entire car. If you don’t want to listen to music from a phone, you can play a CD in the superb Mark Levinson® sound system. A truly wonderful experience. Navigation is simple using the built in Sat Nav, which is displayed on the central monitor. Inputs to this are through the intuitive touch pad, located in the centre column right by the driver’s left hand. the touch pad is also the heart of controlling the entertainment system and car settings. You use it just like a laptop mouse. Lexus anticipate your needs and meet them. true Omotenashi. Shopping trips are easy too, as the car is not too big to make parking difficult in tight supermarket car parks, where everybody is focused on finding a spot near the entrance. The car is loaded with technology to assist with parking too. Parking assistance notifies you when you are nearing an obstacle and you get a display on the central screen. When reversing the screen becomes a monitor for the reversing camera, aiding you to park safely. Once finished shopping, the car can take plenty of bags. I loved driving the NX as it has a high driving position so you have good visibility ahead and all round. The seats are superb with heating and ventilation functions for driver and passenger. The driver has so much technology inbuilt to help make every journey a pleasure, and as safe as possible. Blind spot warning through the door mirrors advises when vehicles in adjacent lanes, behind are not visible in the mirrors. Every NX300h model includes the Lexus Safety System +, a collection of safety features. Pre-collision system with pedestrian detection, Lane Keeping Assistance, Automatic High Beam, Road Sign Assist and Adaptive Cruise Control. As with how you to choose to pull away, the car gives you choices of how you want to drive during your journey. It is fitted with Drive Mode Select, which is situated in the centre column easily to hand. Modes can be engaged during driving, so there is no need to stop. Eco, the most efficient (Economical)driving style, Normal which is an average driving style, and Sport which allows the car to be driven harder and more dynamically. After a week of driving the NX300h, I didn’t find anything to dislike and many things I do like. Good performance and handling, a very capable, versatile vehicle that you can utilise in many ways. It handles the trip to the supermarket, will make commuting easy and relatively stress free and then it can take you and the family away from it all, in to the wilds. Well at least the lanes of the Cotswolds. Sporty enough when you want it to be, yet economical too when you want it to be. 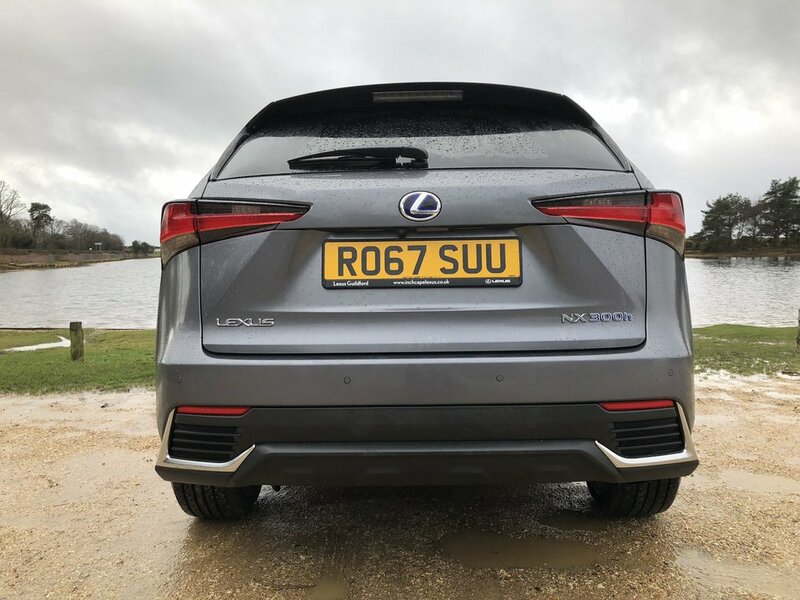 Prices are competitive with rivals such as Audi Q5, Volvo XC60 and the Mercedes GLC, but you get a lot more technology as standard in the Lexus. The Lexus has great styling, and a very distinct look. Toyota’s ideology that spans decades.